Hiclone’s swirling effect makes fuel particles finer and allow up to 85% of the fuel to be burned, as opposed to about 60% in the best of conventional systems. This means you can travel further on the same amount of fuel, the “4X4 Australia” Magazine economy test is at the bottom of this page. Hiclone supplies a more even mixture for LPG vehicles helping to protect the valves. A fuel miser city car for the daily city commute, school run, shopping, easy parking etc… This car would be chosen just based on it ADR expected Fuel Economy, but so many owners claim their vehicles never even come close to the ADR fuel economy they expected. Customer letter - To date we're seeing at least 5% saving on our 2010 Toyota Prius with 1 Hiclone now 4.5L/100km, previously 4.7-4.9L/100km as standard. Prius ADR figure is 4.4L/100km, with just one Hiclone fitted this fuel efficient Hybrid vehicle is now closer to its expected ADR Fuel figure. A touring car would be a large country vehicle, which could carry half your household possessions for weekends away. But how many people use big V8’s in bumper-to-bumper, gridlock commuting, in peak hour traffic. How many hours a week do you need to work just to feed the hungry car before feeding the hungry family? The reality is that we require our vehicles to do multiple tasks, or we just like to drive a certain type of vehicle. Hiclone helps us to reduce these vehicles thirst for fuel. We use our 2.3ton seven seat Mercedes R350CDI AWD for our country runs (but it still needs to get to & from work every day), at over five meters long it is not an ideal city car. The ADR Fuel figure for this car is 8.5L/100km. Fitted with 2 Hiclones & our MorePower engine tuning system - before as Standard it had 195kw & 620Nm – After fitting MorePower tuning box, it now has 224kw & 725Nm. This car has now averaged 7.9L/100km for the last 47,000km, measuring every drop of fuel & km travelled, & on country runs this vehicle can average 6.7L/100km on an individual day run. The trip computer on Mercedes has three logs, instant Economy for that moment, the Current Day’s Economy & Economy From Reset. Our R-class has never been reset, so this is from the day we picked it up from the dealer as a new car. Diesel engines normally don’t reach their peak economy until they have done around 70,000km. Both of our company vehicles have consistently demonstrated better Fuel Economy than their expected ADR figures, & we also achieved the same with our previous cars. 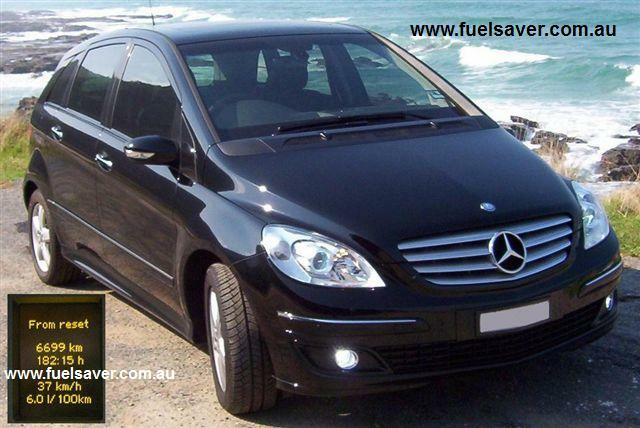 We had a loan car from our Mercedes dealer when our B-class was being serviced, a 1.5ton 2012 Mercedes C200 petrol. We drove this car & our 2.3ton R-class on same trip, one behind the other, C200 did 8.3L/100km, our R350CDI did 7.7L/100km. 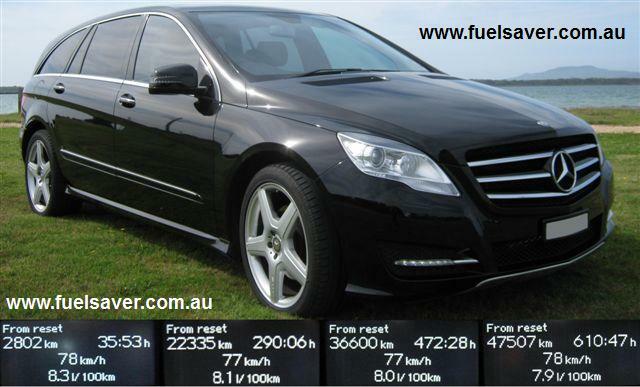 The C200 ADR sticker on the windscreen said it should get 6.8L/100km & the R350CDI should get 8.5L/100km. Carburetor engines generally have the highest fuel wastage, due to the distance the fuel has to travel prior to combustion. The Hiclone carries the fuel in the centre of the airflow, away from the sides of the manifold, to the combustion chamber. For most carb engines, where the air filter is on top of the carb, the Hiclone is fitted in the air filter over the mouth of the carb. Or for engines with a separate or remote air filter, it is fitted in the hose between the filter and the carb. We claim 15-20% fuel savings, but some old cars have achieved figures higher than 35% fuel savings. Hiclone increase's airflow at all times by 20 to 30% in the carb design Hiclones. The only time Hiclone can’t work is when there is a mechanical, electrical or fuel system problem. This means the engine is un-able to match the air/fuel ratio to the increase in airflow generated by the Hiclone product. But most carb engines are wasting over 40% of their fuel, so they will still be running slightly rich even after the Hiclone is fitted. By fine-tuning with Hiclone installed it is possible for a carb engine to achieve EFI levels of economy and performance. If you add a lot of products to a car to increase airflow through the inlet or exhaust, at some point you will need to add more fuel to match (eg: in the UK if you fit a sports air filter to SU carbs you need to use richer needles. Toyota also did this on the Landcruiser carb models with a richer jet for the carb to fix economy problems from standard). By increasing the swirl in the combustion chamber, to over three times the swirl the engine can ever naturally generate, Hiclone reduces the smoke from incomplete combustion by 50%. On the “Reduced Emissions” section of our web site we have the test results for the Nissan Patrol 4.2L Diesel which showed smoke reductions between 45-55% on new and old engines. Fuel savings on a new engine will be 5-10%, and on an older engine 10-20%. “4X4 Australia” magazine tested on a 4.2L Toyota diesel. They achieved 17% with one and 23.5% fuel savings with two Hiclones fitted. For EFI engines, one Hiclone will save 10-15%; two will save 15-20% on fuel. The same % improvement is achieved in both city and country driving. But try one first. Hiclone increase's airflow at all times by up to 21%. By using sensors like Air Flow Meters on the inlet and O2 sensor on the exhaust, the engine's computer (ECU) will match the air/fuel ratio and create a new fuel map. A second Hiclone will give a further increase in airflow. The cars ECU will always re-adjust according to the percentage change in airflow. The only thing which limits the effect of the Hiclone, is the limit of adjustment available in the cars own ECU. For Turbo & Supercharged vehicles we suggest installing Hiclones in two locations. We install the first Hiclone near the intake manifold, after the Turbo (not always possible on Supercharged engines) or intercooler, to improve combustion and economy, this also improves engine torque. But we call this the economy position. The second part is installed near the air filter, before the Turbo or Supercharger. This part helps the Turbo Impellor to spin, reducing Turbo lag, bringing the boost in around 400-500rpm earlier. This is what we call the power position; its main effect is improving engine torque and this torque gain also helps improve fuel economy. The Saab, Landcruiser & Cat dyno graphs are on the “More Power” section of our web site. Fuel savings on a new engine will be 5-10%, and on an older engine 10-20%. It is also possible to install extra Hiclones in power or economy positions to further improve the vehicle. We have a lot of customers with up to 6 Hiclones installed on one vehicle. Hiclone is very effective at fixing problems for gas engines. For both Petrol and Diesel engines the gas mixture and airflow delivered to each cylinder is not even, because of poor inlet manifold design. This causes increased heat and wear on the engines; even the upper-cylinder lubricant has only reached a few of the cylinders. New gas systems now use multi-injectors to try and solve this problem. But even though they now deliver the same amount of gas to each cylinder, the poor design of the factory inlet manifold does not deliver the same amount of air to each cylinder, so the same problem still exists. Hiclone was designed to deliver an even mixture and better airflow pattern to each cylinder. This is why most people comment on how smooth and quiet the engine becomes after installing our product. Hiclone is the most effective gas mixer available and large gains have been achieved with Hiclone on these engines. Some people argue that gas and air mix naturally because they are both gases, but this is the same as saying that oil and water mix well because they are both liquids. Vehicles optimized for gas only will save 5-10%, and up to 20% fuel savings for vehicles converted to gas (Dual Fuel). A 4.2L Carburetor engine Nissan Patrol achieved 17% fuel savings and a BF Ford Falcon with factory straight gas went from 15L/100km to 11L/100km. For older mechanical gas systems, the mixture must always be checked after installation, and it best to set the mixture to be slightly rich, one Toyota Landcruiser 4.5L 80ser customer went from 20L/100km to 16L/100km with Hiclone installed and mixture corrected. When Does Hiclone Not Work? The only time Hiclone can’t work is normally related to Air/Fuel ratio or engine tune. If there is a tuning, mechanical, electrical or fuel system problem. This means the engine is un-able to match the air/fuel ratio to the increase in airflow generated by the Hiclone product (eg: blocked injectors etc..). But this can be fixed. We can tell from customer feed-back what condition a vehicle is in. If it achieves the fuel economy gains we expected then it is in good condition. For most engines the first Hiclone usually saves more fuel than the second; it has access to the most un-burnt fuel. If the vehicle achieves higher fuel savings than we claimed, then it was running a rich fuel mixture. If it does not achieve what we expected, then the vehicle is running lean. Lean engines can waste more fuel than rich mixtures, this is due to fact that an engine needs the energy from the fuel to carry load. A lean mixture causes the driver to press harder on the accelerator pedal trying to find the fuel energy they need. On an EFI (Petrol or Diesel) engine this triggers “Acceleration Enrich Mode” or on a mechanical Diesel this results in what is known as “Full Rail” where a very rich mixture is delivered, which is really only for short bursts of acceleration. A vehicle with this problem, and also towing or carrying a load, can use a lot more fuel than is necessary. Customers with this problem comment that the vehicle has more power, when they pedal the car hard; the Hiclone suddenly has fuel to burn, generating more power. But cruising on highway on light accelerator pedal & lean mixture will not get fuel savings. A lot of EFI commercial vehicles still had a mixture adjustment screw, but no one seems to adjust these. Vehicles like Toyota Landcruiser, Landrover Discovery & Range Rover. The most common problem on these engines for poor economy or performance is from Lean Mixture because the CO (fuel) mixture has never been adjusted since the car was new. These cars are fitted with a mixture adjuster, so that as this fuel system ages, eg blocked injectors, blocked filter or fuel pump losing pressure etc, the car can be adjusted to compensate. When you run out of adjustment then it is time to get the fuel system fixed. If the car runs lean, you pedal it more to make it go, and waste fuel. The Toyota CD ROM for 75, 78, 79, 80 & 100series shows how to adjust it but Toyota dealers have never read it, they just say it is an EFI and tunes itself but the Toyota CD ROM says set to 1-2% CO with tool SST-09243-00020, 2% is best for economy. Most Toyota dealers either don't have this tool or don't have a Gas Analyzer, and so all cars serviced by them have never been adjusted, resulting in fuel economy getting worse & worse as the fuel mixture becomes leaner. If a vehicle has these problems it is why we offer the 30-day money back guarantee, so you have the choice to both have the problem fixed and save more money, or get your money back. Hiclone will not harm your cars ECU, but it will need time to re-learn (about a week) this is why dyno shops that test products by doing one run without, and one run with any product don't know how to use a dyno on an EFI car. Any engine is only as efficient as the amount of fuel it can completely burn per combustion stroke and convert into power (torque). The more air in each combustion chamber, with the correct air/fuel ratio, the greater the density when combustion takes place, the more force is exerted to turn the motor (especially at low engine speeds, where the most fuel is wasted). Hiclone will give you more economy and more engine torque (better towing ability). Because of this improvement in low-end power (torque) your right foot will be on the pedal for less time. You use less fuel to achieve and maintained the same speed. Putting Hiclone’s claims to the test Anthony Kilner tested two Hiclones in his 80 Series Cruiser. There are a lot of products on the market these days that claim to do great things with engine power and fuel economy and here in the office we are always a tad sceptical about them. Hiclone too has caused some hype, but is fast gaining a reputation that it seems to work! The Hiclone unit is a stainless steel ring with directional fins that fits into the air intake system. As the air rushes through it, the unit creates a swirling effect with the air flow which, leads to greater atomizing of the air-fuel mixture, leading to better fuel burning and power. The unit can be fitted in various places within the intake system and after extensive trailing Hiclone have worked out where to put the rings, or rings, for maximum benefit. The rings are identical, it is only the position where they are fitted into the airflow system which designates whether they are a power or an economy ring. Hiclones can be simply fitted to most 2wd and 4wd vehicles and some trucks. Hiclones claims are pretty simple. Across the board a carby engine will get between 15 and 20 percent improvement in economy, an EFI engine will get 10 to 15 percent, LPG gas powered vehicles range from about five to 20 percent, while diesel engines range from five to 10 percent. Every vehicle varies, but Hiclone believe these figures are achievable. My 80 is a standard, normally aspirated 1HZ diesel. 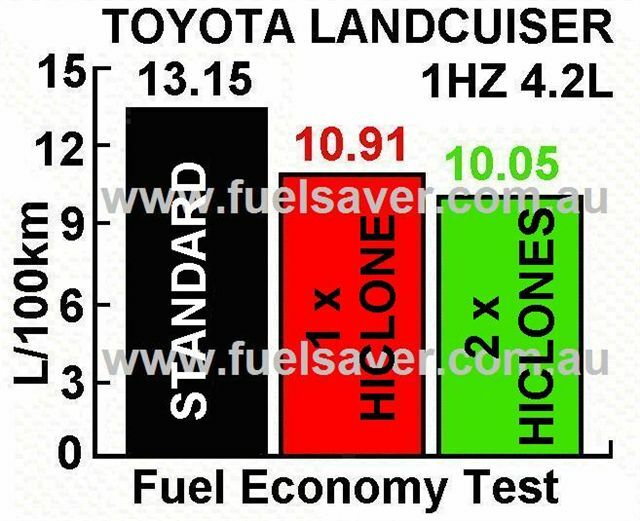 Hiclone’s claim is a fuel saving of up to ten percent on diesel engines. Refer to our charts, but with one ring fitted we achieved a 17 percent decrease in fuel usage and with two rings fitted the figure improved to 23.5 percent. The fuel economy under normal driving conditions around town and loaded on recent trips decreased by around the 14 percent mark, which meant a saving of approx 2L/100km. If you are sceptical about fitting any parts into the air intake system then the Hiclone with no moving parts is a good idea. The rings for my 80 cost $160 each and a lifetime warranty applies. Free installation is available in most states and will soon be available Australia wide. We’ve heard many reports about Hiclones here in the office. For a saving of 2L/100km, if you’re doing any sort of travel it’ll pay for itself soon enough and there’s a 30-day money back guarantee. For details on the Hiclone range, call Freecall 1800 442 566.